North Korea’s leader Kim Jong-un declared that his country has become a “strategic” nuclear power that can pose a direct threat to the US, the North’s state media said Friday, showing defiance of the international community’s growing pressure against its nuclear ambition. 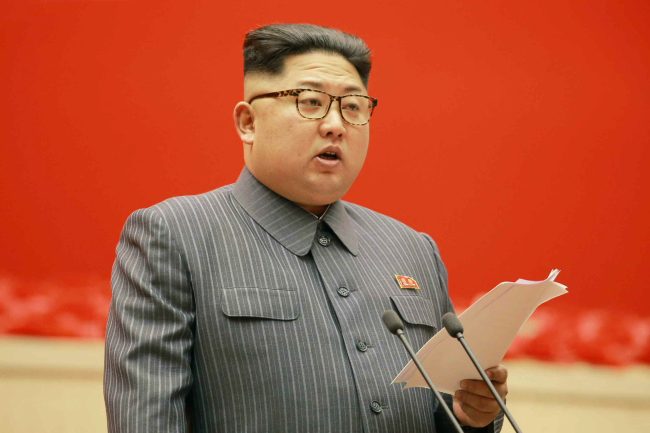 “Nobody can deny the entity of (North Korea) which rapidly emerged as a strategic state capable of posing a substantial nuclear threat to the US,” Kim was quoted as saying by the Korean Central News Agency during his speech to officials in charge of low-level party units Thursday. Kim reiterated that the North had achieved the goal of building a “nuclear force” through a series of nuclear and missiles tests. Following the latest Hwasong-15 ballistic missile launch last month, Pyongyang declared that it had mastered nuclear-strike capability and become a full-fledged nuclear state. The leader also stressed that his country would continue to pursue its nuclear ambition despite growing international pressure against Pyongyang. Kim has asserted that North Korea has established a “self-reliable” economic system based on technology and resources, urging his people to modernize light industry factories, produce advanced daily necessities and revolutionize fruit and grain production. His remarks came during an opening speech at the fifth conference of “cell chairpersons” of the ruling Workers’ Party of Korea. Cell chairpersons are those who lead the lowest-level units called party cells, each consisting of five to 30 members. Some chairpersons’ failure to fulfill the party’s efforts to accomplish economic initiatives were criticized during the meeting, the KCNA reported. The criticism was an apparent attempt to reinforce control over working-level party members and other North Korean residents. Attending the conference was Choe Ryong-hae, who is considered the second most powerful man in the reclusive state. During the meeting, Choe called for party members to be armed with the party’s ideology and anti-US sentiment. Kim Yo-jong, the North Korean leader’s younger sister, was also spotted sitting on an elevated stage at the conference hall, South Korea’s Unification Ministry said Friday, showing her upgraded political status in the communist state. Kim Yo-jong was named an alternate member of the party’s politburo, the top decision-making body, at the general assembly of the WPK’s central committee in October. The decision appears intended to further tighten the Kim family’s grip over the party. “A woman presumed to be Kim Yo-jong was seen sitting on the elevated stand. As she is an alternate party member, the government will closely monitor her status and future movements,” the Unification Ministry’s Vice Spokesperson Lee Eugene said during a press briefing.